The architecture of the thriller suits the Dardennes more comfortably than it might first appear. In spite of their naturalism, the Belgian brothers construct intricate scaffolding for their films to rival many of their more outwardly formalist peers, and The Unknown Girl is perhaps more open about the structural blueprint than anything they’ve produced recently. A generic—in every sense of the word—tale of bad conscience gets the trademark handheld treatment in the dreary world of Liège, but it could just as well emerge from the wet streets of a 40s noir. Guilt comes knocking, as it must, at the door of Dr. Jenny Davin. An unidentified African girl running from something sinister pleads entry into the safety of Davin’s clinic, though the young doctor is too busy lecturing her intern on the finer points of the profession to bother with the noise down the hall. The girl’s body is found nearby, and distraught at the consequences of her indifference, Davin hits the detective beat, searching for the girl’s name in an effort to offer her a modicum of dignity in death that the final moments of her life denied. Ratiocination unveils a web of guilt ensnaring everything in the doctor’s orbit, as if all of Liège harbors some complicity in this original sin, which, given the ethnic lines that divide here, suggests a reckoning with Belgium’s colonial past and present woes, though the capital ‘C’ Catholic Dardennes make it clear that no one escapes the fearful symmetry of guilt’s trap. Trapped, certainly, but not unmovable. Jean-Pierre and Luc Dardenne may be clandestine formalists, but they’re also heart-on-the-sleeve humanists. The maze-like geometry of The Unknown Girl points towards noirish cynicism only to refute it. An embrace—with responsibility, with other people—is enough to open up a way out. Continuing this week at the SIFF Uptown is the latest from neo-realist Belgian masters Jean-Pierre and Luc Dardenne, Two Days, One Night, their first foray into movie-stardom thanks to an Oscar-nominated performance from Marion Cotillard (The Dardennes themselves have never been nominated for an Academy Award, though they have accomplished the rare feat of twice winning the Palme d’Or at the Cannes Film Festival). Cotillard plays a factory worker (solar panels) who has just recently and barely recovered from the suicidal depression that caused a prolonged work absence, thus proving to her bosses that the factory will run just fine without her. She’s been laid off because her co-workers were made to vote on whether they’d rather she continue to work or they get their annual bonus. It’s an absurdly blunt premise that the Dardennes, whatever its worth, remain firmly committed to with their meticulous direct-cinema style. After talking her way into a revote as the film begins, the bulk of the movie follows Cotillard visiting each of her coworkers in turn over the weekend to beg them to allow her to keep her job. The fact that the Dardennes manage to make such a didactic and schematic premise watchable at all is a credit to their skill, and a testament to the fine performances of their cast. Cotillard first and foremost is a stunner, her portrait of a woman desperately trying to keep it together on the brink of disaster is easily on par with her exceptional work in 2013’s The Immigrant, which she probably should have been Oscar-nominated for as well. The only other recognizable face in the film is the man who plays her husband, Fabrizio Rongione, who also played the architect in 2014’s La Sapienza (look for Eugène Green’s very fine film to get a US release in the coming months, hopefully it’ll make it to Seattle), but all the performances are wonderful, each new co-worker bringing a wonderfully individualized set of hang-ups, guilts and possibilities of hope. 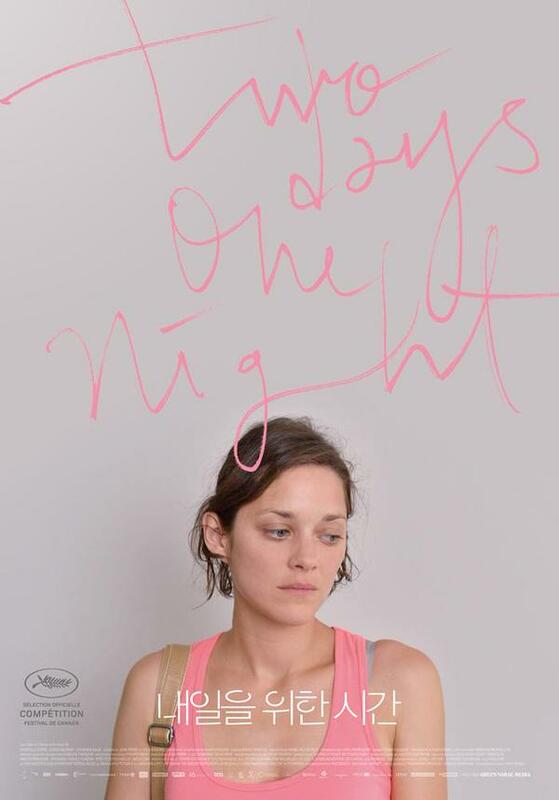 Two Days, One Night plays Friday through Thursday at the Kirkland Parkplace Cinema.